Henri creates timeless clothing with a feeling of casual elegance. Made from 100% organic cotton, the range is designed to be worn day after day, year after year. 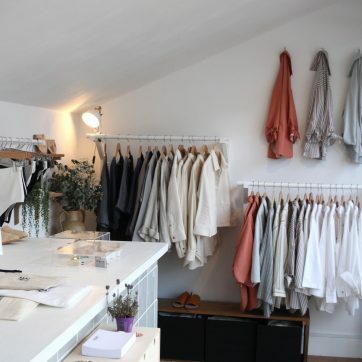 Having recently opened a permanent shop, the collection sits amongst a selection of like-minded brands, each producing their products with incredible thought and passion. Henrietta founded Henri in 2016 after studying at London College of a Fashion. Particularly interested in form, fit and function she wanted to create a niche line of shirts that could be versatile design wise, yet still required the need for excellent pattern cutting and attention to detail. Her love of the English country side and Devon coastline adds a practical and care-free element to a range that is otherwise tailored, giving the renowned Henri fit for being comfortably elegant. Through working on Henri, Henrietta has developed a passion for continued learning on sustainability and social responsibility within the business. Visiting the communities behind the Henri shirts opened her eyes to the importance of continued ethical outsourcing and provided another reason to push the business forward. She is committed to growing Henri so that more rural communities and more disadvantage women may find dignified and meaningful employment within the Henri supply chain.